Technology has changed our lives. But is this a good or a bad thing? Alice and Amith have a debate about what we've gained and lost in the digital age. You'll hear them talking about how life used to be and the big changes technology has brought us. In this unit so far we've already heard the words selfie, photobomb and trolling. What do these new words mean and how are they made? This 6 Minute Vocabulary is all about new words. Listen to the programme and see if you can describe what David Cameron, the British prime minister, is doing. Hello! Welcome to 6 Minute Vocabulary. I’m Rob. And I’m Catherine. And today we’re talking about new words. Yes, new words in English. We’ll look at where they come from, why we need them and who uses them. We’ll have a quiz; and we’ll also bring you a top tip for learning vocabulary. But first, here’s Iris, talking about a photograph she took. And here’s a question: is Iris happy with her photo? So here’s a selfie from a flashmob I went to – there’s everyone dancing and stuff, and that’s my idiot boyfriend at the back: he decided to photobomb me! It’s quite funny though… I put it on my social networks – but the trolls said we looked stupid! I don’t care though, I like it. So that’s Iris. And she said she liked the photo. Good. Now there were a few words there which are quite new in English. Let’s have a look at some of them. Listen again to Iris. Two questions this time. One: what type of photo did she take and two: where was she? Iris took a selfie, and she was at a flashmob. Let’s take those words one at a time. Yes, first of all, a very popular word now, selfie. That’s a photograph you take of yourself, by holding your camera or phone out in front of you at arm’s length. Yeah, selfie. Take many selfies Rob? Don’t want to look at myself, thank you. But where does the word selfie come from? Well the word self-portrait has been around for a long time. It means ‘a picture you draw or paint of yourself’. So selfie probably comes from that. And that’s one way words come into English. Get an old word, change it to fit a new situation and you’ve got a new word like selfie. And that’s one reason why we need new words – to talk about new situations, like all these self-portraits that everyone’s taking. Yeah, good. Now another way to make a new word for a new situation is to get two old words and put them together. Iris was at a flashmob. Now, a flashmob is a crowd of people who gather together quickly and suddenly – it’s often organised through social media. Now the word flash can mean ‘something that happens very quickly’, and a mob is a crowd of people. So when you put them together, you’ve got the perfect new word for the situation. Ever been on a flashmob Rob? I’m afraid not, no one’s invited me actually. Really? I’ll invite you on the next one I go on. Thank you. Anyway, you’ve probably noticed that these words are mostly made by people on social media. It’s not the only place that new words come from, but a lot of new words are coming from social media at the moment. …and that’s my idiot boyfriend at the back: he decided to photobomb me! That’s a sudden period of extreme weather, and then there’s thoughtbomb where people get together and, basically – think! Yes, that’s a new word for what we used to call ‘brainstorm’...? It is, yes. Very similar. I put it on my social networks – but the trolls said we looked stupid! A person who posts negative comments on social media is called a troll. And troll is actually an old word for an imaginary creature – a kind of monster. You find lots of trolls in old Scandinavian stories – and the word’s been around in English for a long time. So an old word, with a new meaning – but there’s a link there to the original meaning isn’t there Rob? Yes that’s right, because both kinds of troll are quite ugly in their own way – either in their looks or behaviour. And we’re talking about new words. So Catherine, have you ever been trolled? Thankfully I haven’t Rob, I choose my friends very carefully on social media. Right, it’s quiz time! Question one: what’s the word for a group of people who gather together suddenly, and it’s normally organised on social media? Any ideas? The word is flashmob. Question two: what word means: ‘jump into someone else’s photograph’? That’s photobomb. Finally, what’s the word for people who write nasty, negative comments online? They are trolls. OK, well done if you got those right at home. Well done indeed. And now here’s a vocabulary tip. To keep your English right up-to-date, join some social media groups where people use English. Social media is a great place to pick up words and expressions that are in use, even though they’re not in the dictionary. Yes, and new words are being invented all the time aren’t they? OK, well there’s more about this at bbclearningenglish.com. You can also find us on Twitter, Facebook and many other social networks but, don’t troll us please. OK. Join us again soon for more 6 Minute Vocabulary. 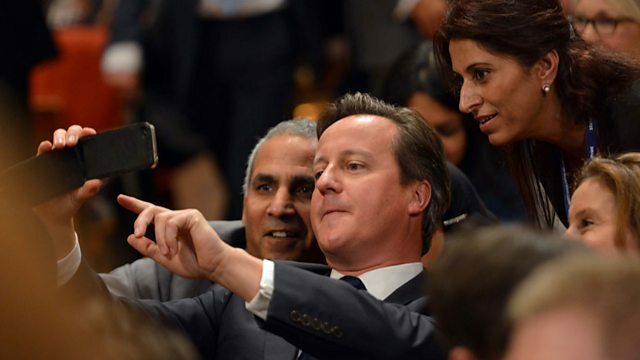 So Cameron was taking a selfie - a picture of himself! Even prime ministers can't resist getting a good picture of themselves! You can download 6 Minute Vocabulary from our Unit 17 downloads page (size: 14.47MB). You can also subscribe to the podcast version. Do you think life was simpler before the digital age? Now you can compare your ideas with Alice and Amith's. In Session 2 we look at used to - the structure we often use to talk about things we did in the past that have now changed.